There’s recently been some silly-season noise about making the use of bells compulsory in our newspaper of record, The Times. This story seems to have been based entirely on five written questions from the MP Julian Lewis. Re @thetimes article about bicycle bells, it is based on 5 parliamentary questions posed by Julian Lewis (MP for New Forest, Conservative) to @transportgovuk . The non-committal response from the Minister has been spun into a story; the Minister in turn dismissed it. But let’s (charitably) take this seriously, just for a moment. What does ‘mandatory use of bells’ actually mean? Am I supposed to ding every time a pedestrian hoves into view? In a town or a city, my bell would be ringing relentlessly. Let’s also bear in mind that plenty of people will object, often quite aggressively, to the ringing of a bell, interpreting it as akin to the honking of a car horn. A basic starting principle – before any of this nonsense ever gets anywhere near legislation – would have to involve getting some basic agreement and consensus about what people actually want and expect, when it comes to a form of audible cycling warning (or even whether they want people making a noise at all). It you can’t get the general public to agree, which I would imagine is more than likely, then there’s no point even embarking on legislation in the first place. In any case, the general issue of bells, warnings and ‘silent rogue cyclists’ is symptomatic of basic design failure. I’ve probably cycled at least 500 miles in the Netherlands over the last five or six years. Not a huge amount, but enough to get a good flavour of the country. In all that distance – in cities, in towns, through villages, across the countryside – I can’t honestly remember ever having to ring my bell to warn someone walking that I was approaching. Not once. A large part of that is probably down to the fact that people walking in the Netherlands are – understandably – fully aware that they will encounter someone cycling quite frequently. In general, it’s unwise to assume that, just because you can’t hear anything approaching, nothing is approaching – and this is especially true in the Netherlands. 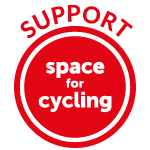 Being aware of cycling is just an ordinary part of day-to-day life, because everyone cycles themselves, and because they will also encounter cycling extremely frequently. However, I suspect my lack of bell use is also due to the fact I rarely ever come into conflict with pedestrians, because of the way cycling is designed for. Unlike in Britain, where walking and cycling are all too frequently bodged together on the same inadequate paths, cycling is treated as a serious mode of transport, with its own space, distinct from walking. I don’t need to ring my bell to tell someone walking I am coming up behind them because we’re not having to share the same (inadequate) space. There are of course many situations in the Netherlands where walking and cycling are not given separate space – a typical example below. However, these will almost always be situations where the numbers of people cycling, and of people walking in particular, will be relatively low. In practice, these paths function as miniature roads, marked with centre lines, and used by low amounts of low-impact traffic. Pedestrians treat them as such, walking at the sides, and the dynamics of path use are obvious and well-understood. If demand for these paths increases, such that people walking and cycling begin to get in each other’s way, separation of the two modes becomes a necessity. It is all blissfully rational. Contrast that with Britain, where ‘cycle routes’ will often be nothing more than putting up blue signs to allow cycling on existing – often quite busy – footways. It isn’t hard to see why people walking will not be expecting cycling in these kinds of environments. It looks like a footway; feels like a footway. It is a footway. So users who are cycling then have to decide how best they approach someone from behind. Do they ring their bell? Do they try to make a noise with their bike? Do they call out? And if so, what do they say? Do they try to glide past without any noise at all? Bear in mind that there is absolutely no consensus on which of these techniques is preferable to people walking. Some people hate bells, because they think it implies they are being told to get out of the way. Some people don’t like noises, or calls, and apparently prefer the clarity of a bell, and what it signifies. Some other people might be deaf. As you cycle up behind someone, there is obviously no way of knowing how that particular person will react, and what they will prefer. It is entirely guesswork. My own technique is usually to approach, slow down a bit, and hope that the person gradually becomes aware of my presence. If they don’t, then I usually say ‘excuse me’. My bell is reserved for occasions when someone is stepping into the road without looking, or similar situations where I can foresee a potential collision occurring. A short snippet below, on a path I use on a daily basis. I can see that the two girls are aware that I am approaching, but I slow down in any case, until I am sure. The woman is not aware, so again I slow down, and have to use a verbal ‘excuse me’ to let her know I am there. This probably isn’t perfect. Maybe there is a better way. But really, I don’t think there even is a ‘perfect’ way of dealing with these kinds of minor conflicts. They are all flawed. You are going to startle someone; you are going to do the wrong thing without even realising it; you are going to annoy someone. It’s unavoidable. But the solution to this problem is not MOAR BELLS or MANDATORY USE OF MOAR BELL. The basic issue here is crap cycling and walking environments. Every single location where people are being expected to use bells (or some other form of audible warning) will be one where cycling is not expected; where someone cycling is having to share the same space as someone walking; where there is not enough width for the two modes to peacefully co-exist. Bells are not the solution to this problem. Better design is. The path in my video above is only a couple of metres wide, and has to accommodate cycling and walking in the same space. That’s just a straightforward recipe for conflict. If you think the answer to that conflict is bell legislation then you don’t care about cycling, and frankly you don’t really care about walking either. I don’t want to be cycling at little more than walking pace, having to ring my bell every few metres. I doubt people walking want to be having to deal with that either. I certainly don’t when I am on foot. Let’s stop dribbling on about bells and instead ensure that our walking and cycling environments work for both modes, with clarity about where people should be and about expected behaviour, and with comfortable space for everyone. This entry was posted in Inclusivity, Infrastructure, Social safety, Subjective safety, Walking. Bookmark the permalink. I think your approach is awful, sneaking up on walkers rather than ring a bell a good distance away, and I’ve rarely had any complaint about my mellifluous bells and only occasionally bizarre reactions (a guy a few years ago pretty much threw the lady he was walking with into a hedge, for example! ), but I agree wholeheartedly that forced use of bells is not the solution. The solution is better designs to support walking and cycling by providing sufficient width for the volume of use – bring it on! Re ringing bells “a good distance away” – you must ride in places where you don’t regularly encounter people riding horses or listening to something on their headphones. I do, and it can be a lot trickier in practice than your chirpy comment implies. Yeah, maybe it’s just different in Norfolk, Cambridge and London where I cycle most at the moment. I do encounter horses but rarely on cycleways. Even their riders seem to quite like a bell as long as you’re not near enough to startle the horse… but I suspect enough people cycle in Norfolk that most horses get used to bikes – it’s not that unusual to see someone cycling along next to their horse-riding friend on the country roads, having a chat. Headphones can be a challenge but in my experience, few walkers have them so loud that it blots out all else. If you have to ride on a carriageway, some motorists are far worse, driving along with their windows up and music blaring, usually on top of a noisy engine. They can’t hear hardly anything! It’s a mystery why people go on about people walking or cycling wearing headphones but motorists are allowed to be deaf. Oh and I do remember ringing my bell in the Netherlands, but it’s much rarer than here and it happens at last as often to alert a cyclist who’s about to turn across you on a quiet cycleway without looking (because they’re used to there not being any other users there). In The Netherlands a bell is tolled to warn the person in front of you that you want to pass in situations where the bike path is too small. E.g, when they ride two abreast and you want to pass them. I would always stay behind the pedestrian, slowing down to walking pace until it is safe to pass. To me, ringing a bell is rather akin to cars sounding their horn when they feel a cyclist is taking up too much of “their” space. A cyclist has no more right to the space than a walker in the same way that a car-driver has no more right to the road than someone on a cycle. I agree that separating the two modes is preferable, and think it is ridiculous that in places like Hyde Park Corner where there is plenty of space to separate the two modes, cyclists and pedestrians are being lumped together. Drivers (not cars – they rarely do it themselves) mainly sound their horn to say hello. At least, that’s what happens to me. Sometimes it’s people I cycle with but they’re driving for work. So when I hear a horn, I wave! It’s usually a quick pip or double-pip – leaning on the horn is far more aggressive. Horns can be used in a few ways, much like a good bell but not quite as expressive. Bells are mandatory in Germany. I don’t use it every day in Berlin, but when I have to bicycle through touristic parts of the city tourists are often walking on bicycle lanes (to be fair, they are often only marked with red stones). I also use them on mixed-use paths when large groups are walking abreast. I don’t even bother having a bell on my bike for these reasons. If someone is walking where I want to cycle, then I too just approach slowly and maybe call out an “excuse me”. I also always say “thank you” in the cheeriest possible tone if someone moves out of my way, because I don’t people to continue to think all cyclists are rude! It probably makes no difference, but I try. Sneaking up quietly on people and startling them by shouting “excuse me” seems very likely to make them think cyclists are rude. Get a bell! It’s not rude. People do exactly the same thing when jogging and, if they’re not being rude then neither is a person with a bicycle. Okay MJ. We got your message. You think bells are great and asking is rude. But you do understand that all you’ve done is illustrate the author’s point? Yes you have an opinion, but that’s all it is, and some people have the opposite opinion. I’ve had people thank me for using a bell as I passed them, but equally I’ve had pedestrians take issue with my use of a bell, as they clearly considered it to be impersonal and rude, despite me using it at a distance and deliberately having a tuneful bell. One even said irately “what’s wrong with politely asking to pass?”. You can’t win. In 40ish years, I’ve never had anyone complain about a nice dulcet bicycle bell and suggest I should have snuck up on them instead. It sounds like walkers near you are really strange! It’s very easy for people to say “there is no consensus” just because someone somewhere objects to everything, but it’s not really true. Bells are mandatory in many countries. It is up to the user how they wish to use them. Never mind about alerting pedestrians ahead of time (MJ Ray’s approach of ringing a bell a good distance away is also mine), it’s also good etiquette to warn other cyclists when overtaking them on London’s city streets. Mark Treasure: Exactly what do you mean when you refer to MOAR BELL and MOAR BELLS? There’s a useful website called Google. Other search engines are also available. Bells are mandatory in the Netherlands as well, although i’d be really surprised if anybody got a fine for not having one in the last 30 years. On rural roads and in busy city centers, they can be useful to alert pedestrians using the cycle path, or when overtaking. However, on rental bikes, you often find asians and americans ringing them all the times, which is really, really annoying and sometimes dangerous. Zoom up behind pedestrians, slam on brakes, pull a big skid, ring bell lots as fast as possible. Ok, what I really do is ring the bell once lightly from a distance, best chance of not sounding aggressive. I have some sympathy with the view that in some circumstances bicycle bell ringing can feel much like many uses of car horns (that is, even if not meant in such a way, it can feel aggressive/angry/impatient). Like others, I would rather slow down and wait behind a pedestrian until there is space to pass than ring my bell. If I do try to communicate with the pedestrian, I do it verbally, because that seems less impersonal, and can convey better information than the sound of a bell. A particular concern of mine with ringing my bell when approaching a pedestrian in order to pass them is the imprecision of it: a bell is unlikely to tell a pedestrian, for example, on which side of them you intend to pass, and there is a risk of sudden unpredictable movements by the pedestrian which may make a collision more likely. You can’t win, you’re a cyclist, some people are going to hate you regardless, might as well ring the bell. A ting from a distance is less aggressive. Consideration goes both ways, deliberately not allowing a bike to pass on a shared use path is outright rude. I’ve used my air-zound before after ringing my bell, the idiot person (side by side with others) said something like they have right of way, well sure they do but that doesn’t mean they can be a***holes and block the shared path for no good reason. Other people were thanked not horned.